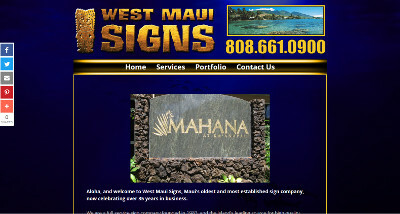 Ken, the owner of West Maui Signs, reached out to us several months ago asking about our website services. He was referred to us by Tom, one of our customers that owns Classic Signs. Tom has referred several customers to us over the past couple of years due to our diligence and ease to work with. Ken had a very old website that was a Flash animated site. The site was never fully completed. Because Flash does not work on the majority of web browsers now, the website was pretty well useless. After some time, Ken was ready to move forward. He was also using Yahoo as his hosting provider and was not pleased with the level of support they provided him. So we also took on the website hosting for him as well. Ken was instrumental in providing us the exact images he wanted and a blueprint for what he wanted on the website. While it did take a few months to perfect the website, he wanted to ensure the new site met his vision and had a great eye appeal to it. The site has been fully completed and is now open to the public! Ken’s website is at westmauisigns.com. 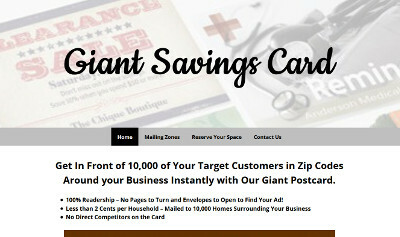 Bruce emailed us and needed a fast turn-around on a new business venture – Giant Savings Card. He wanted to get a simple site created that was low budget since he is not sure whether the business will take off yet. He plans to offer oversized postcard advertisements in two markets and potentially expand to other markets if successful. Bruce emailed us the material he wanted on each of the websites quickly. Upon making the initial payment, we had the website mostly completed within 24 hours. We created the homepage first and made changes to it the same day and finished the other pages on the same day. The website has been approved and Bruce has the ability to update and make changes to his website as needed. The website for Giant Savings Card is at giantsavingscard.com. 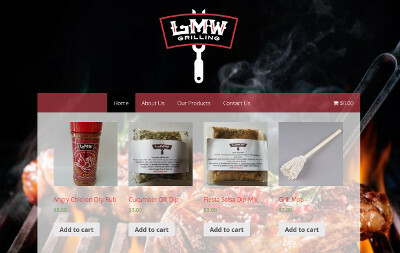 Lou, owner of LMW Grilling, contacted BsnTech Networks asking about getting an eCommerce website created for his grill rubs and mixes. Lou didn’t want a complicated or fancy website – just a simple site that was right to the point with his products and an easy checkout process. We got right to work on the website after Lou sent over his logo and the material that we needed to configure the eCommerce capabilities. After a few weeks, he finalized the pictures and information for his products and added those to the site as well. The website is now open for business and he is ready to take orders! Jerilyn emailed us in need of modifying her logo a few weeks ago. She recently moved from one market to Florida and opened her dog care service. We modified the logo for her very promptly – within an hour of the initial payment. Jerilyn was so impressed by the level of service we provided her that she asked us to also make her website. She already had all of the pictures, text, and the layout that she wanted on the website – but just needed someone to put it together. We delivered for her yet again! Within two days of getting technical issues straightened out with her hosting provider, the website was done and completed! Hairy Barker’s K9 Care website is at hbk9care.com. Amy emailed us in need of a logo design for their family’s pizza business, James Street Pizza Co. Amy stated that they had a custom-made brick oven and it was important for the logo do have this as one of the main ideas. Our logo designer started working on it right away and had some initial designs ready for Amy to review within a week. After reviewing the logo, they requested to combine aspects of two of the designs into one. This was completed by the next day and they approved the design. Janecia, the owner of Stepping Stone Phlebotomy, has been a customer of BsnTech Networks for almost a year. A few weeks back, she wanted to have some changes done to her website to modify and make it look nicer. During those conversations, she also explained that she wasn’t pleased with the prior logo that was being used on her marketing materials or on the site and asked us to make a new logo for her. Janecia provided the specifics she wanted in the logo. Our designer created three different initial designs. Right away, Janecia liked one of the designs and we didn’t need to make any additional changes to it. The website updates have since been completed and the new logo is also on the website. Terry reached out to us about a website and logo design need. He is starting a trucking and logistics company and wanted to get started with an online presence and branding. Last week, our logo designer completed the logo and it was approved by Terry. The logo design went through a few modifications upon the mock-up designs being presented to Terry but they were done quickly! We are still working through the creation of his website and will write about that soon! Jake contacted us in need of website design services for his business. 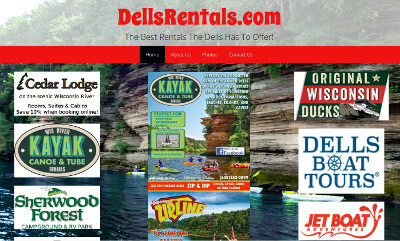 He provides advertising services for attractions in the Wisconsin Dells area. He previously reached out to another website designer but they were dragging their feet and taking too long to complete Jake’s website. Therefore, he decided it was time to terminate that agreement and move to a more responsive website designer. BsnTech received the information that Jake wanted on the website and had the site mostly done within 24 hours of the information being sent – well in time for Jake’s deadline for his advertising to come out. After about a week, some final changes were received today and the website was completed and approved! The website is at dellsrentals.com. Sim, Robert’s son, contacted us inquiring about our website design services. His Dad (Robert) is an author with several published book. He has two separate blogs through BlogSpot but wanted to have an actual website that they could customize themselves. BlogSpot is great for doing blogging, but there is no real customizations available to add various pages or features. Sim and Robert were ready to move forward with the website design. Once we received the needed information, we had the website done within the same day. Later on, the plan is to migrate all of the blog posts from the BlogSpot website to the new site. Then they will have only one website with everything – and will eventually have the ability for the website to automatically notify subscribers when new blog posts are added. 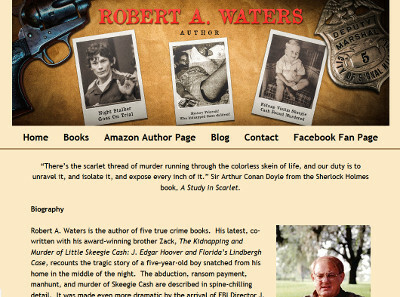 The website for Robert is at robertwaters.net.